Thanks to the relatively new route, Ocarina of Time 100% runners have been racing to be the first to score a sub-3 hour time. Finally, last week, long-time record holder zfg1 achieved a 3:58:45, helped along by a 1st try Dampe, a notorious random element within this run, which can end record dreams very easily. Despite this impressive time, zfg and other runners are still working to push the time down even lower. 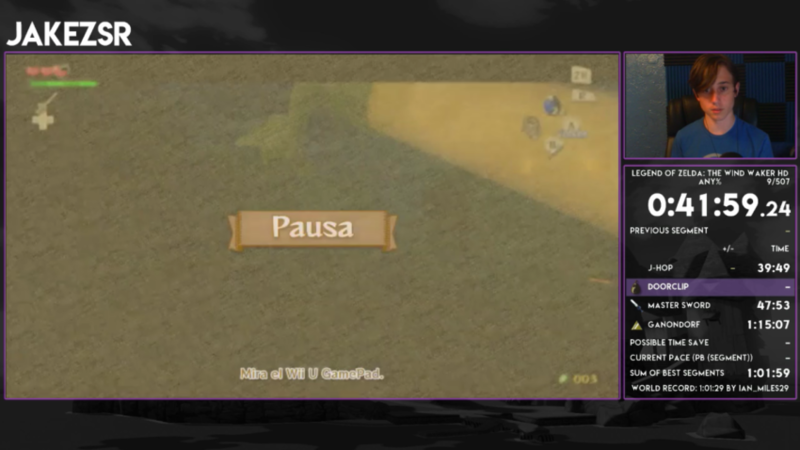 Meanwhile, in the Wind Waker HD camp, the first sub-hour any% run has been posted by runner Ian_Miles29. The 59:46 run consists of various small but important time saves, and some small route changes. Also taking place this month was the ZeldaSpeedRuns 3D Remake Relay Race, which pit 16 top level runners against each other, in a 9 and a half hour speed extravaganza. If you want to find out exactly what went down in the race, you can check out the Zelda Runners Sequence Break article! 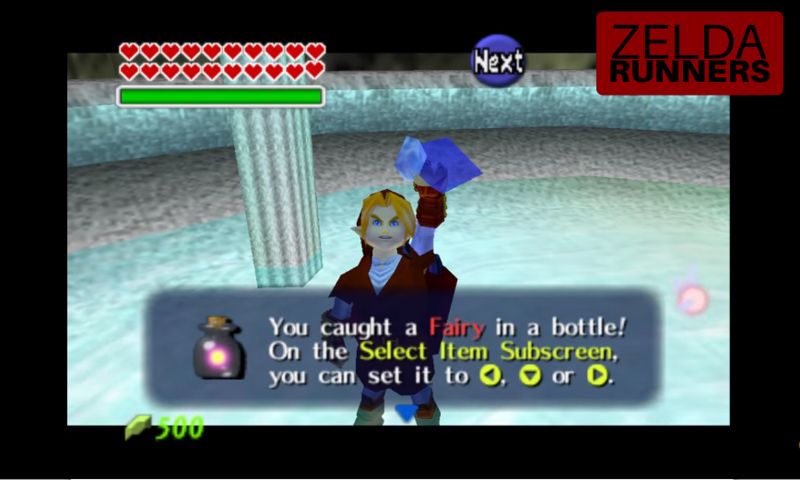 If you’ve ever seen an Ocarina of Time run, you’ll know how crazy some of the tricks and glitches are. Explaining every tiny detail would take months, so let’s take a closer look at some of the larger glitches used in speedruns. The first of these is known as Bottle Duping. As the name might suggest, it allows the runner to overwrite a C-Button item with a bottle. 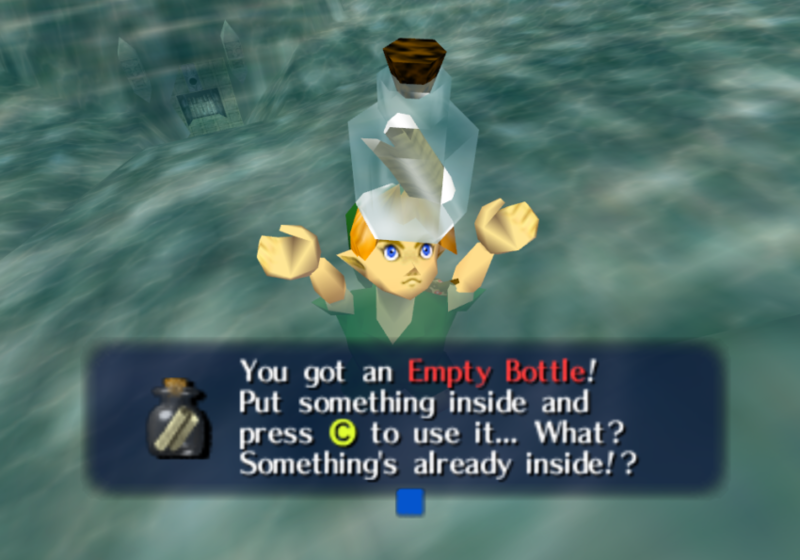 These bottles can be slightly glitched – for example, Fairies will not automatically revive Link after death, however, for the most part, they can be used in place of regular bottles. There are various methods to achieve this. The fastest is known as the Quickswap Method, which is used to duplicate items that cannot interrupt a bottle swing. To execute this, the player should swing a bottle at a catchable item (bugs, fish, fairy, etc), pause on the first frame of this swing, then use the un-pause to buffer the item’s button. Sounds hard? It is, and for that reason, this method isn’t widely used. Thankfully, there are easier methods to Bottle Dupe. The most common of these methods is the Pause Method. Once again, the player should swing a bottle at a catchable item and pause mid-swing. While paused, the player should equip another item over the swinging bottle, then unpause. Now the item that was equipped over the swinging bottle should also be a bottle. The bottle can also be duped over a blank slot simply by equipping the swinging bottle over another empty space. A similar method is called the Ocarina Items Method. This involves pressing the bottle button and another item button while in mid-air (during a backflip for example). 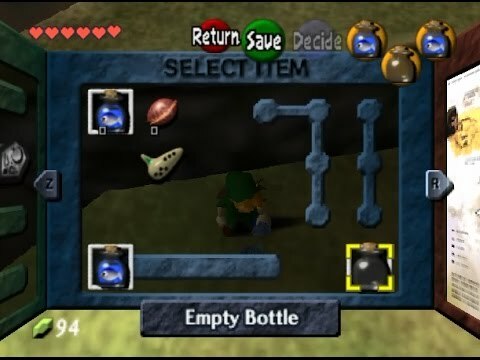 Upon landing Link will empty the bottle, and the item will be duped. For this method to work, the bottle must be in a state known as “full”. To achieve this, simply empty the bottle, then re catch the contents immediately. Another particularly useful method of bottle duping is the Shieldswipe Method. This method involves standing in front of an item while holding a bottle, and crouching. At this point, press the button of the item you want to dupe over, and hold R, Z, and the bottle button. Release R to swing and catch the item in front of you, and the item you chose to dupe over will now appear as a bottle. Why is this method in particular useful? In order to activate a glitch known as Bottle on B, the runner must first place a particular item on their B button, usually a Deku Stick, or the Fishing Rod. If using the Fishing Rod method, the Shieldswipe Bottle Dupe technique is used to transform the Rod into a bottle. “But Euan!” I hear you shout, “Why on earth would we ever want a bottle on our B button? Surely a sword is much more helpful in the eternal battle against the evil shadows…”. Well, yes, perhaps a sword is slightly more useful in a physical fight. 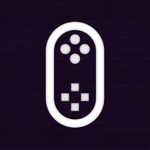 But when it comes to speedrunning, having a bottle on our B button is incredibly useful, as it gives us access to two memory exploits – Bottle Adventure and Reverse Bottle Adventure. These allow runners to place almost any item, weapon, or other inventory object in to your inventory at any given time, using precise memory manipulation. Explaining it in detail would take up a whole Glitch Exhibition segment so, as we’ve already covered quite a bit here, I’ll leave the specifics to another day. 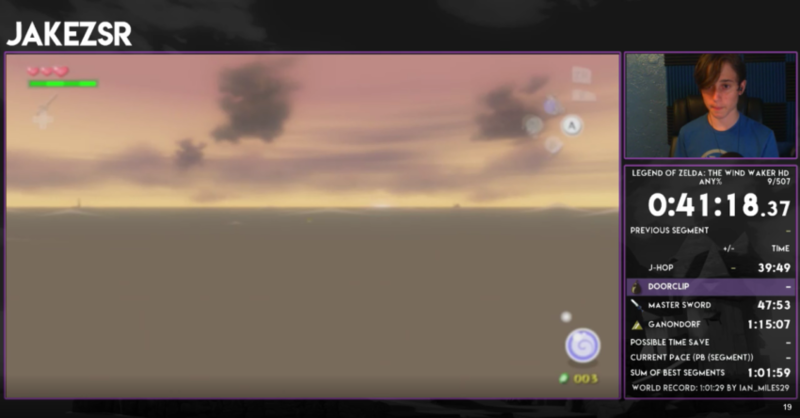 This week’s spotlight is Wind Waker HD runner, JakeZSR. I had a chat with him about his experience with the game and its community. Jake: Hello! I’m Jake, I’m a Zelda speedrunner who’s dabbled in quite a few games in the series. While I mainly run The Wind Waker HD, I have also tried out: Twilight Princess (HD and SD), Ocarina of Time, and The Wind Waker. On the The Wind Waker HD leaderboard, I’m currently in 7th place with a time of 1h 25m and 59s in Any%. I also currently am the world record holder in JotWaD (Jump off the Windmill and Die), a meme category that has you, well, JotWaD. I’ve assisted in the routing for the fastest beginner Any% route and created the bingo application of The Wind Waker HD (a bingo style gamemode used for races and just for fun). EC: You’re currently based in running The Wind Waker HD. What is it about that game in particular that draws you back to run it over, say, other Zelda games? Jake: The Wind Waker HD is a very unique speedgame, it’s extremely broken and incredibly cool to watch and run. It’s also had a huge amount of changes in the last year or so, the introduction of barrier skip in the run being the biggest. As you may already know, Any% used to be polluted with a heavy luck based trick known as the Fairy Hover (which has about a 5% chance of working). This trick practically killed Any% for a few months before a new trick: the Morth Hover, was found. This trick removes nearly all RNG from the trick and single handedly brought Any% back from the grave. These amazing glitches alone makes the run so satisfying to complete. The game has hardly any down time, with the ability to skip all but 2 dungeons and the ability to gain massive amounts of speed (item sliding), you’re nearly always doing something. But overall, the short category and fun tricks makes me come back to The Wind Waker HD over and over again. EC: You’ve also dabbled in the SD version of the game. How different are the two to run? Are there any tricks or glitches which you find harder or easier in one version or the other? 2 glitches which, combined, save over 2 hours in Any%. The actual feel between the two games is different as well, as HD has gyro aiming and the ability to equip items without pausing the game. Jake: I eventually want to learn Ocarina of Time 100%, it’s a very interesting category and has a ton of cool tricks. I also have looked at Super Mario 64 and some indie platformers (such as Hollow Knight or Eagle Island). EC: With the discovery of Barrier Skip and Morth Hover, the popularity of The Wind Waker HD as a speedgame must have changed quite a lot over the last few years. What’s it like being part of the game’s community? The Wind Waker HD community is honestly one of the best communities I’ve ever been in. Everyone is really supportive and helpful about everything. We often have community races and are all generally friends. We’re also super accepting to new players, and will often help get them started and help them out if they have any issues when learning certain tricks or parts of a route. EC: If you could only run one category of one game for the rest of your life, what would it be, and why? 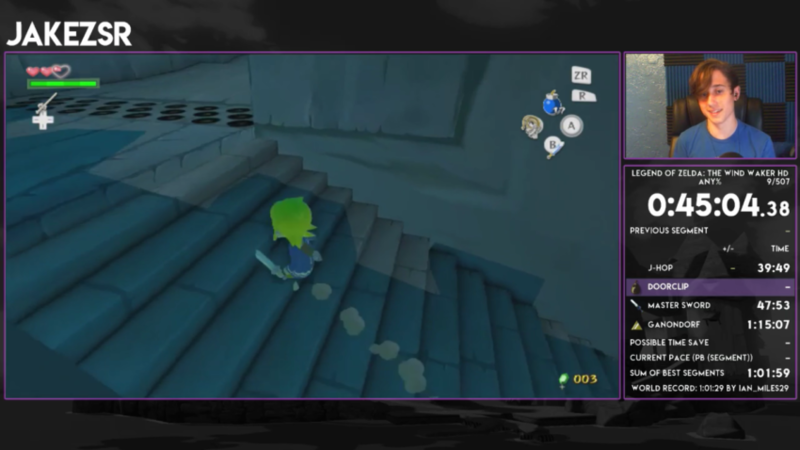 Jake: Definitely The Wind Waker HD All Dungeons. All Dungeons is a very interesting category because it showcases a lot of the game, while at the same time showcasing a lot of cool tricks that you don’t see in a normal Any% run. It also has a decent length (around 2 and a half hours) so it would keep me occupied for a while. Jake can be found on Twitter and, of course, streaming on Twitch. Phew! I’m just about done for this article, so here’s what’s coming your way over the new few weeks in the speedrunning world. UK Speedrunning Marathon – 17th August ~ 19th August – The UK’s very own speedrunning marathon, raising money for charity Special Effect. Breath of the Wild features as the event’s penultimate run. Metroid Marathon 2018 – 17th August ~ 20th August – Take a look at the title and have a guess as to what might feature at this event. All your Metroid needs in one marathon – don’t miss it. 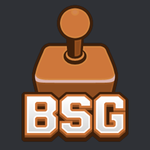 BSG Annual 2018 – 18th August ~ 25th August – The Benelux Speedrunner Gathering 2018 event is featuring various Zelda titles, including the CDi games, alongside various other popular speed games. That’s all folks! Make sure you check out the sequence break article on the Remake Relay, or catch up on the event itself! See you soon!